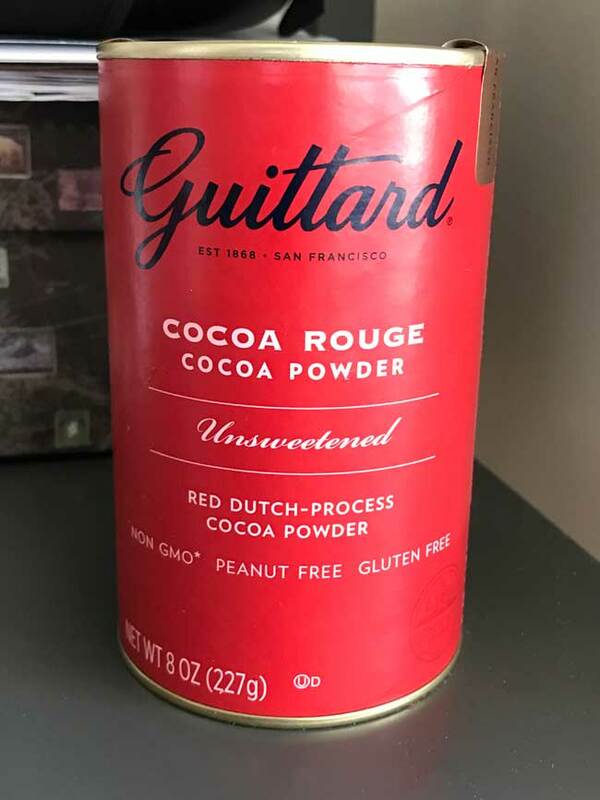 I usually go for natural cocoa powder, but last week I picked up a canister of Guittard’s “Cocoa Rouge”, a Dutch processed red cocoa powder known for its color, depth and complexity of flavor. Hmm, complexity of flavor – that sounds a little pretentious, but like wine, some cocoa powders just seem to have more going on. That’s why I usually like “natural” as opposed to Dutch process which has been treated with alkali and has a pleasant but slightly different and milder flavor. The Cocoa Rouge is the best of both worlds in that it has a Dutch process, fudge-like, pudding flavor but seems to have the character of natural. When I bought the cocoa powder at Sur La Table, the sales associate assured me that I would not be disappointed and that my cake would not be red – not that I was really worried about that, but I suppose a lot of people expect it will make their baked goods look like red velvet. Nope! 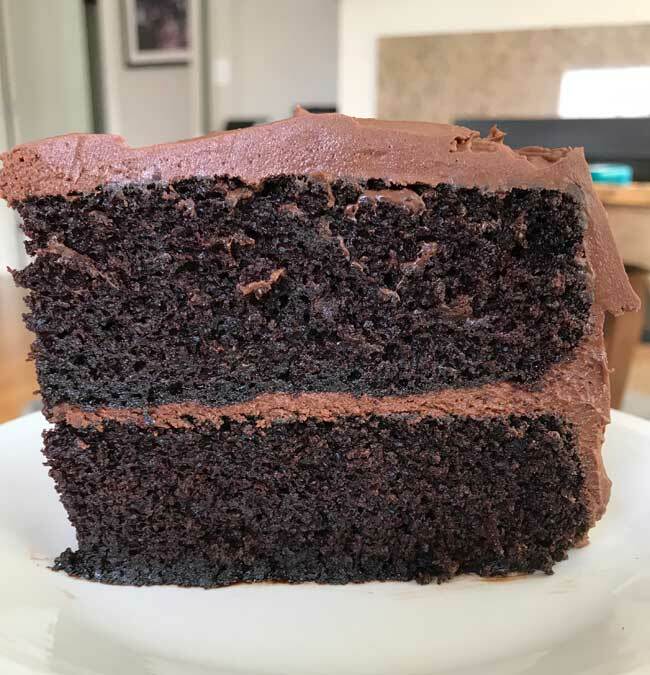 Here’s a slice of chocolate cake made with the red cocoa powder. 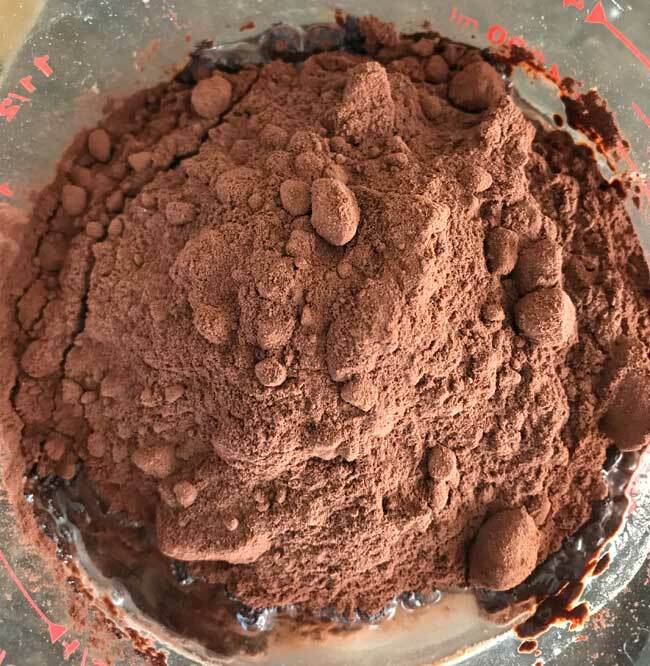 Here’s what the cocoa powder looks like on its own – again, not too red, just subtly red. So far, I’ve only tried it in two things — the cake and these macaroons. Next I think I’ll try it in my favorite chocolate ice cream recipe, Alton Brown’s Chocolate Ice Cream. But we did love it in the macaroons, so here’s the recipe which is straight off the can. The can says it makes 15, but I’ve made these twice so far and have only gotten 8. These are chewy, VERY chocolate-y and have no flour so they are almost candy-like. 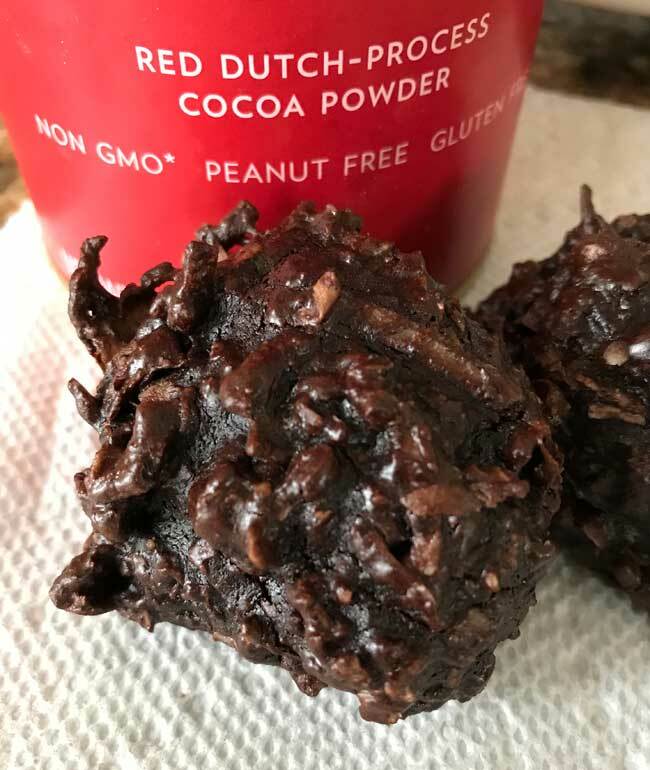 Chewy chocolate macaroons made with ground almonds and Guittard red cocoa powder. Preheat the oven to 350 and line a large cookie sheet with parchment paper. In a mixing bowl, mix together the cocoa powder, almonds, sugar and salt. Add the egg whites and vanilla and beat on low speed until glossy. Stir in the coconut. Using a cookie scoop (medium) or about a 2 tablespoon measure, scoop out rounds and arrange them on the baking sheet a few inches apart. You should get about 8. Bake for 15 minutes or until the macaroons appear set. Allow them to cool directly on the baking sheet, then transfer to a wire rack to finish cooling. They taste great frozen, so I recommend storing them in the freezer in a zipper bag. Oh, that sounds good! Reminds me of this one. I bought this cocoa rouge since it’s called for in the delicious coffee cake recipe in Bouchon Bakery’s cookbook. It’s a ripple of chocolate within the light and fluffy individual cake. Sounds delicious!!! I enjoyed reading about the cocoa powders too. Interesting! I’m going to try these! !